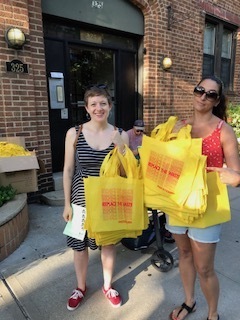 A pair of Golden staffers were ticked off that activists from Fight Back Bay Ridge had the gall to pass out flyers during a street fair. Staffers for Senator Marty Golden must immediately stop trying to block a group of Bay Ridge activists from expressing their free speech rights by stumping against the incumbent at a weekly summer street fair, the group’s lawyer said this week. Fight Back Bay Ridge organizers have used Third Avenue Summer Stroll, which is held over four consecutive Fridays in August and June, to leaflet against Golden and his poor record on speed cameras. Last Friday, organizers passed out 350 “Stop Marty Golden” hand-held fans and 200 fliers highlighting the the senator’s positions. 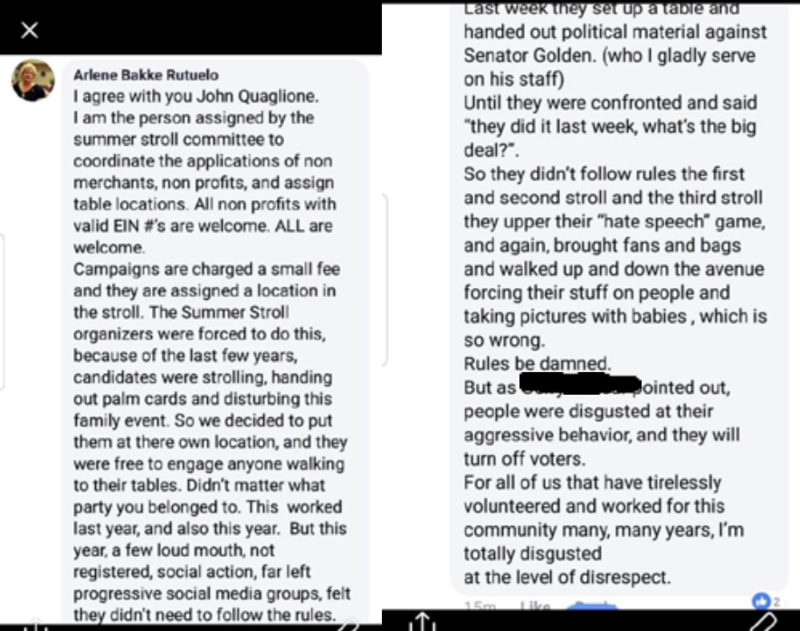 Afterwards, Golden staffers John Quaglione and Arlene Rutuelo claimed on Facebook and Twitter that the activists are not permitted to canvass during Summer Stroll — and made unsubstantiated claims that the FBBR organizers were hostile. Another Facebook post by Quaglione was later deleted after pro-Golden commenters suggested they would bring “bats” and “riot gear” to this week’s Summer Stroll. Put together, the posts amount to “First Amendment retaliation,” attorney Eugene Strupinsky wrote in a cease-and-desist letter sent to Golden on Tuesday [PDF]. The First Amendment, after all, prevents politicians from blocking speech that might be critical of them. Rutuelo’s role as both a Golden staffer and an organizer of an event on a public street, and Quaglione’s role as a Golden aide, connect them to Strupinsky’s assertion of a free speech violation. Fight Back Bay Ridge has taken up the speed camera issue in its effort to oust Golden from office this year. The city’s lifesaving speed cameras, which have reduced speeding by 63 percent in locations where they’ve been installed, went dark on July 25. Golden professed support for legislation to renew and expand the camera program, but he also endorsed legislation that would have terminated the cameras in six months. The senator, who has been caught on camera speeding 14 times, received more than $19,000 in campaign contributions from the Patrolmen’s Benevolent Association, the largest organized opposition to the program. In 2005, he also ran over a pedestrian who later died. It’s unclear why Quaglione expressed such frustration online after activists crossed paths with Golden and his staff on Aug. 3. Both groups were “all smiles” during the interaction, according to a report by Bklyner. Fight Back Bay Ridge organizer Sally McMahon said Golden made a remark about letting the voters decide in November. Quaglione, however, attempted to grab one of the fans out of a volunteer’s hands and asserted that the group had no right to distribute fliers during the event. It is much more than that just a politically connected person being a nuisance, Strupinsky argued. It is about one of America’s most important principles. The back-and-forth comes just days after Golden’s re-election campaign committee filed a complaint with the state Board of Elections requesting an investigation into Fight Back Bay Ridge’s fundraising and connections with Democratic candidates running against Golden. Golden’s team asserts that the group is a campaign committee that must file financial reports with the state. Put together, the Facebook posts and Board of Elections complaint represent a coordinated effort by Golden’s staff to fight back against Fight Back Bay Ridge, which has raised all of $1,415 on GoFundMe.com. By comparison, just this year, Golden has raised $247,015 — with a substantial portion coming from business interests, police unions, real estate companies and lawyers. An email to Quaglione was not returned. John Quaglione – the Susan Lucci of Bay Ridge politics. What an angry, incompetent doofus. Electeds and candidates should have info tables (I had one last year) but groups with political agendas creating hostility on @3rdAveBayRidge shouldn’t be allowed to ruin a fun night. Well, for some people beating up Golden supporters who bring baseball bats and riot gear would be the very definition of fun. I learned a long time ago there are two ways to get people to go along with you when your viewpoint is correct and theirs isn’t. The best way is to obviously convince them with reason. The second way is to just keeping batting them over the head until they relent. They may still not understand why you’re right, but they’ll know it hurts when they go against you. Marty Golden killed a innocent elderly woman and somehow came up with $750,000 hush money to silence her grieving family. Betcha a enterprising reporter could find out some real illuminating connections if the source of the $750,000 payoff was uncovered. Our columnist is still writing about Marty Golden's obsession with traffic safety.